By Daniel Horowitz--Canadian business leader and philanthropist Seymour Schulich, along with UJA Federation of Greater Toronto, are recognizing 40 of Canada’s most promising youth by awarding them each with a Schulich Leader Scholarship for undergraduate study in STEM (Science, Technology, Engineering, Mathematics) subjects. This prestigious scholarship recognizes Canadian high school students who exemplify a combination of academic excellence and leadership ability. And earlier this month, the first group of Schulich Leaders of Canada was selected for study in the fall of 2012. Each of the 20 participating universities could select a maximum of two Schulich Leaders to represent their institution. This elite group of individuals was selected from 977 Schulich Leader Nominees nationwide, earning them an entrance level scholarship valued at $60,000 each. Eligible students are in their final year of high school, secondary school or CEGEP (in Quebec) and were nominated by their school administration. An additional 20 Schulich Leaders will be selected in Israel in August 2012 at five participating universities. This $100 million scholarship initiative is the brain-child of Mr. Schulich to secure the future economic competitiveness of Canada and Israel. The scholarships are designed to ensure that future leaders are amongst the next pioneers of global scientific research and innovation. 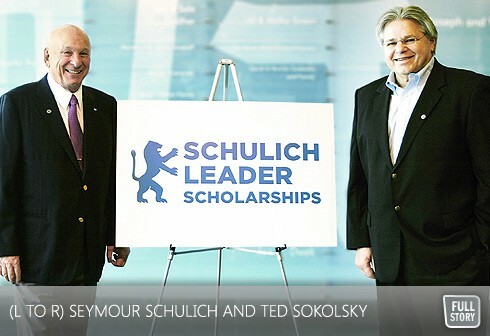 UJA Federation of Greater Toronto administers the Schulich Leaders initiative. For information about this year’s recipients, as well as eligibility and application details, please visit www.schulichleaders.com.